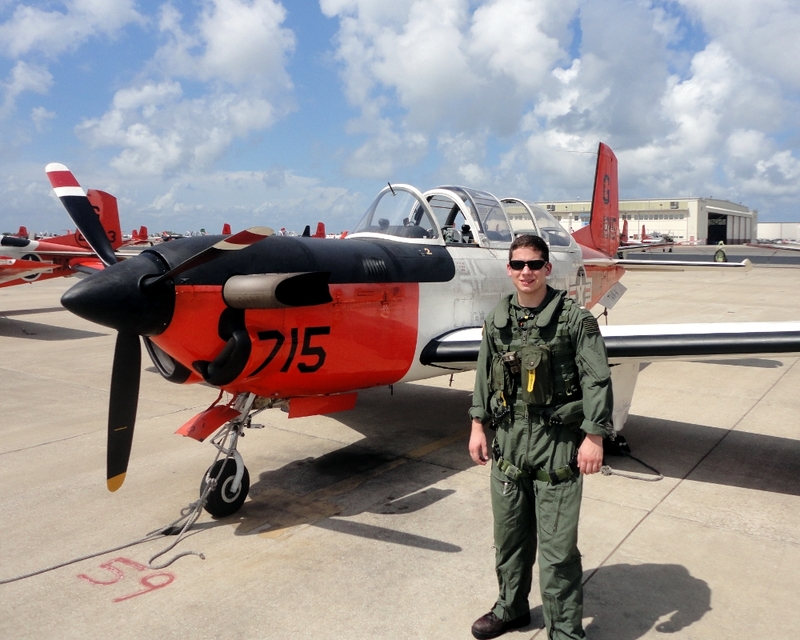 The T-34C is unlike anything I’ve ever flown before. Most notably, it’s got a turbine engine, so it’s power to weight ratio is much higher than a piston engine. That translates to 550 SHP of American freedom pulling you skyward. Turbines take longer to respond to power changes than do pistons. This necessitates that the pilot always be ahead of his aircraft; that he anticipate adjustments before they are required. Furthermore, the pilot must develop an accurate feel for the position of the power lever, as the lag makes it impossible to follow the needle (propeller shaft torque, in this case) to the desired power setting. This airplane must also be trimmed very carefully, to within degrees of pitch attitude, in order to maintain the desired altitude profile. Unlike any other airplane I’ve flow, the T-34 has trim wheels for all three control axes. In addition to elevator trim to maintain altitude, the high torque produced by the engine demands constant vigilance on the rudder. Every change in power or airspeed, therefore, must be accompanied by a change in rudder trim. Aileron trim, in general, need not be reset during flight. However, the servo (positive feedback) action of the aileron trim tabs produce a very high roll rate (up to 150 degress/sec) that is initiated by very light control pressures. Update: Jan 20, 2013 As of November 6, 2012, my days flying the Mentor are over. 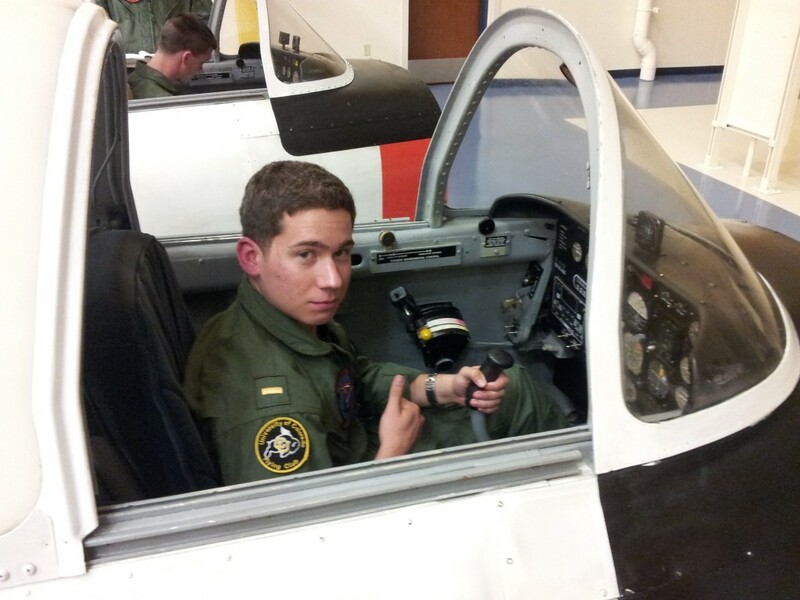 After about four months and 80 hours of flying, I’m done with Primary and Corpus Christi. 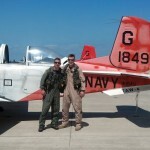 While I am quite fortunate to now have the opportunity to try my hand in jet land, I had a great time flying this plane. I experienced many firsts: first turbine engine, first solo aerobatics, first formation flights, and first instrument approaches. I struggled at the beginning, but by the time I got to formations, I think I hit my stride. It felt great to have the throttle in my left hand and the stick in my right, looking out the canopy at my wingman just a few feet away. I loved the satisfaction you feel when you look outside for the first time and see the runway perfectly lined up after a long flight on instruments. I’ve tamed this airplane, and now I’m on to bigger and faster things. But if the opportunity ever presents, I’ll eagerly take the helm of the Mentor once again. 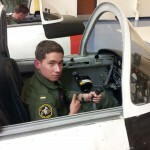 Sitting in a static cockpit trainer, learning the switchology. Before I realized that the left hand goes on the stick. 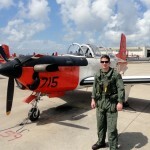 Posing with the plane after my first T-34 flight. 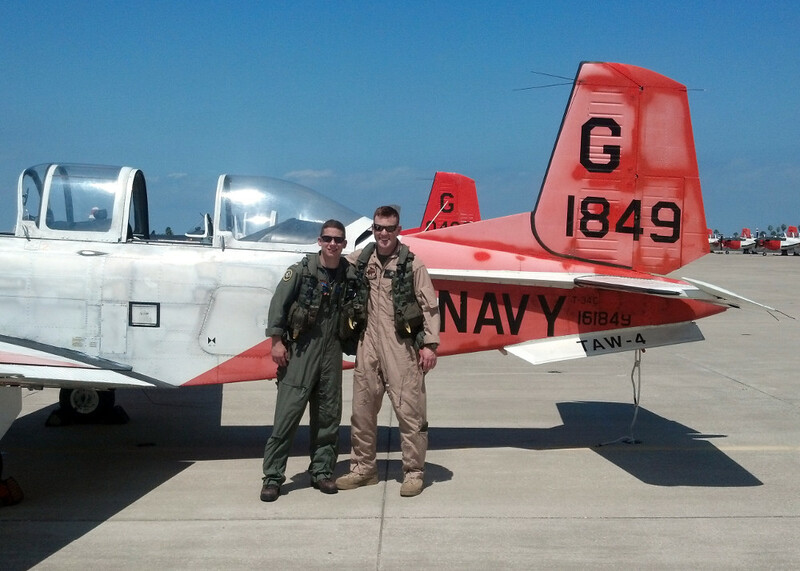 Kyle and I, after our formation solo flight. 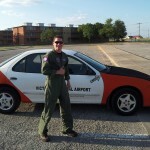 His last flight in the TorMentor. One of the perks of flying and out-and-in to Victoria, TX: you get a festively-painted crew car to fetch dinner.